To commemorate National Seafood Month and celebrate the many health benefits of fish and shellfish, non-profit Seafood Nutrition Partnership (SNP) is hosting a series of fun, interactive and educational events in cities across the country. The goal for these events is for all Americans to be aware that seafood is a lean protein filled with vitamins, minerals, and essential omega-3s EPA+DHA, which are vital for supporting optimum health. Seafood Nutrition Partnership is hosting a series of fun, interactive and educational events in cities across the country. 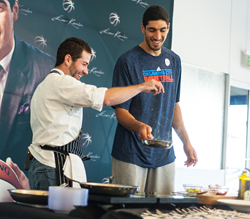 In Oklahoma City, Thunder player Enes Kanter will share a seafood message. This tour will bring the healthy heart message to six cities through Healthy Heart Summits this fall, gathering leaders from business, healthcare and community together to discuss the importance of a heart-healthy diet and the impact on the local community. Sept. 30: Charleston, W.Va., is hosting a public Seafood Fest at Capitol Market from noon-3 p.m. The fun and interactive event will feature cooking demos from three area chefs, an oyster shucking contest, children’s activities, and Healthy Heart testimonials from area celebrities including TV Host Jim Strawn and City Councilman Andy Richardson. The Healthy Heart Summit in West Virginia will consist of a combination of four events, also including a seafood week at Kanawha County Schools, October 9-13; a parent seafood tasting at Kanawha City Elementary School; and Charleston Seafood Week, Oct. 22-29. These events will feature a variety of seafood, including salmon grown in West Virginia by The Freshwater Institute. Oct. 10: Memphis, Tenn., is hosting a half-day event, which will bring together thought leaders throughout the city to elevate the conversation on community health and collaborations for heart health, healthy eating and chronic disease prevention. Sponsored in part by Alaska Seafood Marketing Institute, there will be a cooking demo using Alaskan salmon. Oct. 12: Indianapolis, Ind., will host a half-day program on the essential role of nutrition in improving Hoosier health, and how that includes a whole-hearted approach to wellness. There will be a keynote address by Olympic Gold Medalist and WNBA All‐Star Tamika Catchings, as well as a cooking demonstration from Indianapolis sustainable seafood pioneer, Chef Ryan Nelson. The Summit will also offer omega-3 screenings, user-friendly resources to encourage healthy dietary habits, and identify action items to support the heart health goals of the community. Oct. 19: Oklahoma City, Okla., will focus on the importance of a healthy city and state, with messages on improving health outcomes through nutrition and physical activity. Thunder player Enes Kanter will share a taped message about what eating seafood has done to improve his basketball game, and the Oklahoma Nutrition Information & Education Project will host a cooking demo with food provided by US Foods and Alaska Seafood Marketing Institute. Oct. 22-29: Charleston Seafood Week will feature specials from 20 restaurants across the Charleston area, which are participating in the third-annual event organized by SNP. Oct. 23-27: The Indiana Restaurant & Lodging Association has teamed up with the Seafood Nutrition Partnership to bring seafood nutrition awareness to diners in the Indianapolis area for the fourth year. In Birmingham, Ala.,there will be a market day, similar to Charleston’s Sept. 30 event, and a restaurant week. Stay tuned for dates of those events. Follow SNP, #Seafood2xWk and #HealthyHeartPledge on Facebook, Instagram, Twitter and Pinterest.